Development of an e-channel that enhances knowledge transfer and technical information on livestock activities funded by the rural development programme in Northwest England (RDPE), and linking the programme services with farm businesses. 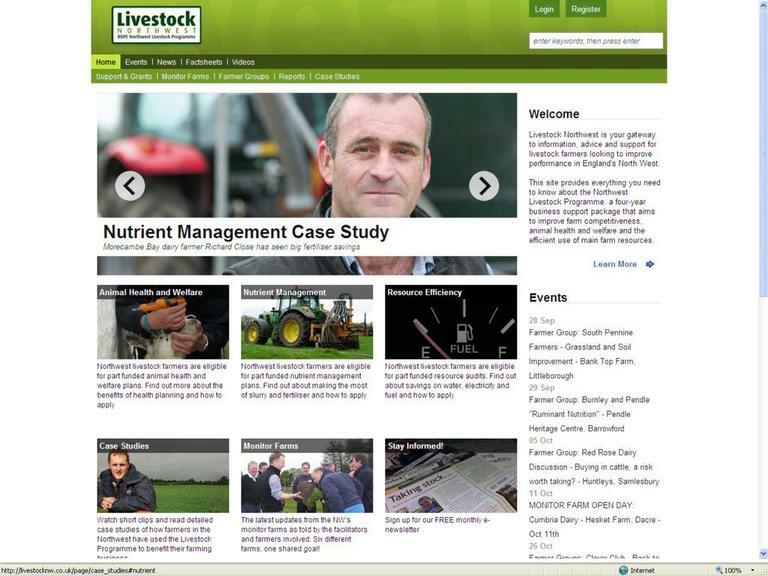 Livestock farmers in Northwest England need quick, accurate and up-to-date information, advice and support. Knowledge transfer and technical information provision through a website is part of a wider support package offered through the Northwest Livestock Programme. It also acts as a channel to disseminate information relating to other activities and access to consultancy support. The overall aim of the project is to provide a communication channel between livestock farmers and businesses in Northwest England about funding opportunities and projects implemented under the Rural Development Programme for England (RDPE) to improve farm competitiveness, animal health and welfare and ensure efficient use of farm resources. 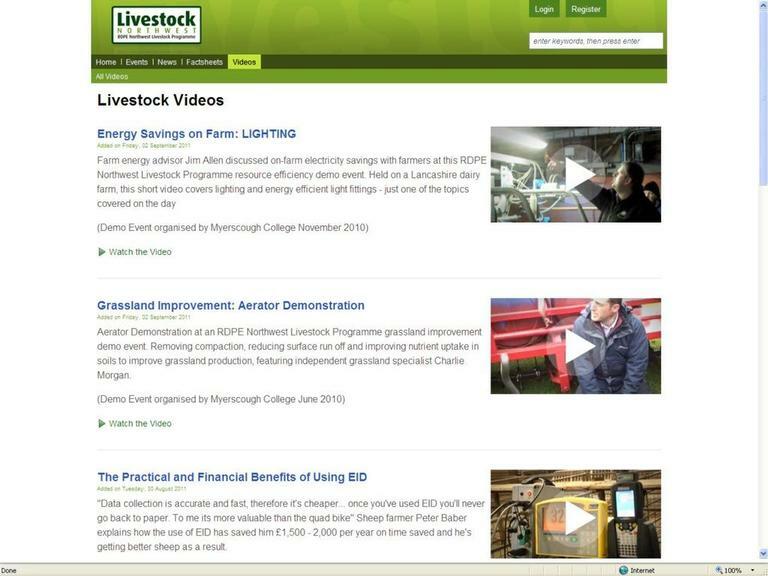 Myerscough College has taken the initiative and set up an e-channel consisting of a website with news, technical fact sheets, reports from demonstration events and group meetings. A calendar of events includes the facility to book online, and there are separate discussion forums for farmers, vets and advisers involved in other Livestock Programme projects. The website was tested by a small group of farmers before it went live. Monthly and quarterly newsletters are also produced. The website was launched in August 2009 and by 31 January 2011 it had 19 422 visits and 11 687 returning visitors. A total of 801 people receive the monthly e-newsletter and 44 farmers with no email have registered to receive hard copy updates. The website enhances the visibility of the use of rural development funds through case studies of beneficiary livestock farmers. The site is regularly updated with content including audio-visual support. Testing the website by the users has been a critical factor for ensuring highest quality when it went live. Dissemination of information in different forms (website, video, e-newsletter, printed newsletter and case studies) helps share experience efficiently. A website with relevant information for farmers is an incentive for them to use the internet and offers a single point of information for all RDPE Northwest Livestock Activity.